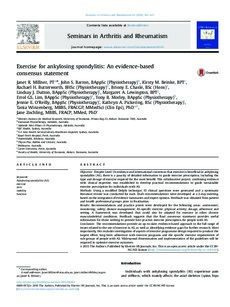 Objective: Despite Level 1b evidence and international consensus that exercise is beneficial in ankylosing spondylitis (AS), there is a paucity of detailed information to guide exercise prescription, including the type and dosage of exercise required for the most benefit. This collaborative project, combining evidence with clinical expertise, was established to develop practical recommendations to guide sustainable exercise prescription for individuals with AS. Methods: Using a modified Delphi technique, 10 clinical questions were generated and a systematic literature review was conducted for each. Draft recommendations were developed at a 2-day meeting, based on the integration of evidence summaries and expert opinion. Feedback was obtained from patient and health professional groups prior to finalisation. Results: Recommendations and practice points were developed for the following areas: assessment; monitoring; safety; disease management; AS-specific exercise; physical activity; dosage, adherence and setting. A framework was developed that could also be adapted for exercise in other chronic musculoskeletal conditions. Feedback suggests that the final consensus statement provides useful information for those seeking to provide best practice exercise prescription for people with AS. Conclusion: The recommendations provide an up-to-date, evidence-based approach to the full range of issues related to the use of exercise in AS, as well as identifying evidence gaps for further research. Most importantly, this includes investigation of aspects of exercise programme design required to produce the largest effect, long-term adherence with exercise programs and the specific exercise requirements of sub-groups of people with AS. Widespread dissemination and implementation of the guidelines will be required to optimise exercise outcomes.